All students are given the opportunity to access a range of vocational activities which differentiated to support inclusion. We use our own enterprise skills to support students’ enjoyment and fulfilment while identifying strengths and progression. Enterprise forms a large part of the Catcote curriculum. It promotes creativity and acts as a stepping stone, leading into employment. 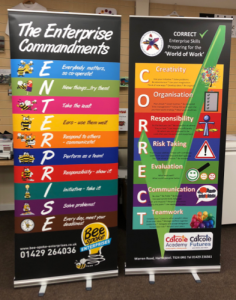 Students following the yellow pathway make use of the Catcote 10 Enterprise Commandments. As the students take part in enterprising activities, their use and demonstration of the 10 enterprise commandments is recognised and promoted with the aim of developing an ‘I can’ attitude. “CORRECT ” Enterprise Skills. These skills have been created to help our students recognise and develop the skills they will require to help them in the world of work. Students following the blue pathway use the “CORRECT ” Enterprise skills while taking part in internal and external work placements. These skills are directly linked to the skills required in the workplace. The recognition and recording of these skills helps each learner to identify their own strengths and areas of development, as well as the types of employment which will best suit their abilities and interests.